Tag line: "Join the Evolution"
Bryan Singer’s X-Men, based on the popular Marvel Comics series, opens in a German concentration camp during World War II, where the Nazis are dragging a young boy (Brett Morris) away from his mother and father. He cries out for his parents, who are also fighting to reach him, and as this emotional scene intensifies, something amazing happens; the chain link fence separating the boy from his parents begins to bend and warp, as if a powerful magnet were suddenly pulling at it. But it's not a magnet causing this. It's the boy himself. He is a mutant, and will one day become Magneto, the chief nemesis of Dr. Xavier and his X-Men. Professor Charles Xavier (Patrick Stewart) is the headmaster of a school for ‘gifted’ students, yet those Dr. Xavier calls gifted, which includes children who can walk through walls and read minds, everyone else has classified as mutants. While many would rather forget they exist, Dr. Xavier, also considered a mutant due to his telepathic powers, is determined to find a way for his kind to peacefully co-exist with the human population. Unfortunately, fellow mutant Eric Lensherr (Ian McKellan), who goes by the name Magneto, has other plans. When an overzealous United States Senator named Kelly (Bruce Davison) tries to enact legislation that will segregate mutants from the rest of society, Magneto declares war on mankind. To protect the earth from Magneto’s wrath, Xavier forms a team of his best and brightest, each with their own unique abilities. Among them are Storm (Halle Berry), who can control the weather, and Wolverine (Hugh Jackman), a new arrival to the facility whose entire skeleton is metallic. Together, this team, now known as the X-Men, will do everything in their power to stop Magneto from carrying out his diabolical plan. 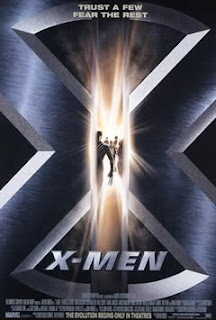 X-Men is both a taut action film and an entertaining introduction to a most unusual world. Dr. Xavier is aware humans don’t yet trust his kind, but is encouraged enough by what he sees at his school to hope that, one day, society will also recognize their potential. Magneto, on the other hand, is as distrustful of humans as they are of him. With his small band of followers, including the shape shifting Mystique (Rebecca Romjin) and Toad (Ray Park), Magneto intends to take what man will not give. Which brings me back to the opening scene in the concentration camp, and the reason I believe this movie, indeed the whole series, is a step above the standard superhero fare. In recreating this terrible event, X-Men helps us to understand its villain, and the emotions driving his actions. Forcibly taken from his family by the Nazis, Magneto will no longer willingly submit to injustice. So when society attempts to isolate mutants, he fights back. Even if we prefer the nonviolent methods of Dr. Xavier, we're nonetheless in tune with Magneto’s motivations. By providing insight into both sides of the argument, X-Men blurs the line between right and wrong. It's a nuance apparently present in the myth itself (admittedly, I'm not an avid reader of the comic), and one that director Singer has captured perfectly in his film. Regardless of how many cinematic chapters there ultimately are in the X-Men saga (thus far, there have been five), this first entry insured its characters would never be as simple as black and white. Singer's direction is good and he obviously has a love for these comics but I just think that he had a problem here with handling all of these different stories at once. It was a fun blockbuster though and definitely gets over-shadowed by its awesome sequel. Good stuff here bud. @dtmmr: While I think I liked this one a bit more than you did, I will agree that its sequel is definitely the best of the series. I echo both of you that the sequel is even better than this one, I love Brian Cox as the villain. That said, this one is excellent and really jump started the superhero movies in Hollywood and proves that a comic book movie doesn't have to be fluff. @Ruth: Thanks for the comment, and sorry for the late reply! I agree this one got the ball rolling as far as superhero movies are concerned, and is an entertaining movie in its own right. But yeah, the sequel IS the better film!